My dear husband and me. This is a picture of my husband Bill in front of a store in Gruene near New Braunfuls, TX on our 22 anniversary. We had a wonderful time. Above that is me by a tree (that I can't ID, comment if you can :) ) in front of Gruene Hall. Yes, Ginny W and Kramer are there. What fun this little tourist trap is. Ginny has an admirer named Kramer. He follows her like a puppy in love. 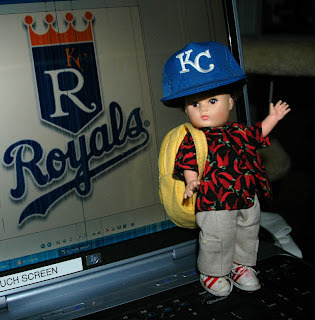 He is a big fan of the KC Royals. He is a real penny pincher and saves all his money to impress his love. (He carries it with him in his backpack, because he does not trust the banks). 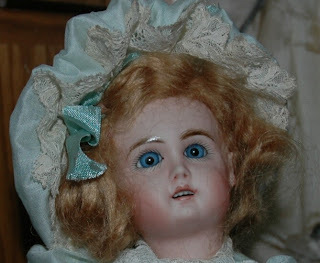 My favorite doll of course is my travel doll, Ginny WINTHMN. She has got to be the center of attention in all things dolly and some things not dolly! She is very well traveled. Has been as far from home as Costa Rica, and to many places all over the USA. Don't want Daisyette left out. She is Bleu's BFF and they share clothes , shoes and toys. OK. 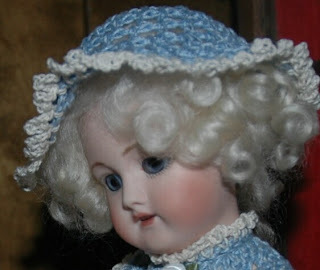 I have joined the yahoo group for Bleuette Doll People. So many nice folks there. I like my online dolly friends! Here is my Bleuette! She was made by a friend I met online too. 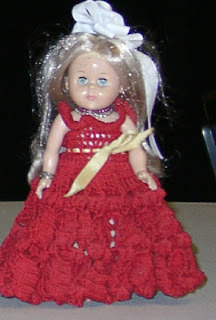 I really like this doll. Sylvia did a wonderful job. All the way down to the handmade shoes! I am still not convinced I know what I am doing with these blogs. But I am going to try to make a comment everyday or so and keep it going.